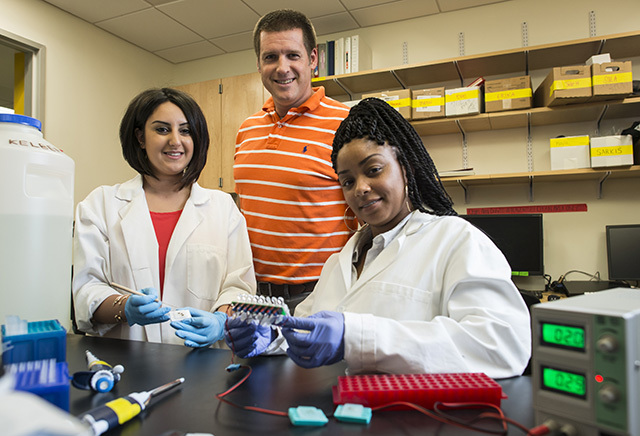 Left to right, CSUN biology graduate student Yvess Adamian, biology professor Jonathan Kelber, and biology graduate student Malachaia Hoover work recently published an article announcing a novel and groundbreaking method to extracting RNA from tissue samples. Photo by David J. Hawkins. Hundreds of millions of cancer samples, each the size of a saltine cracker, have been archived across the globe. These samples contain genetic information that can radically improve cancer patient survival – even curing difficult-to-treat tumor types. Extracting this information out of these cancer samples has been a major bottleneck to progress in oncology research — until now. California State University, Northridge cancer researchers have developed a novel method for extracting these genetic data from archived pancreatic cancer tissue — this cancer type is known for its very low survival rate at only 7 percent — with results that could enable major future breakthroughs for this disease. Their research was published in the September edition of the journal Oncotarget, and will directly address recommendations made to the National Institutes of Health in response to United States Vice President Joe Biden’s Cancer Moonshot Initiative, announced last February, which is slated to provide $1 billion toward cancer research efforts. 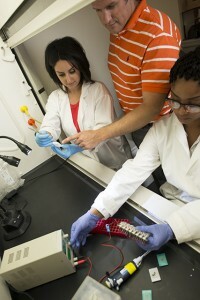 CSUN biology graduate students Yvess Adamian, left, and Malachaia Hoover, right, prepare tissue samples for RNA extraction with a groundbreaking method utilizing a microHomogenizer, with biology professor Jonathan Kelber, center, assisting in the lab. Photo by David J. Hawkins. Biology professor Jonathan Kelber and two graduate students, Malachaia Hoover and Yvess Adamian, integrated a miniature blender-like tool the size of an eraser head into a standard method for purifying Ribonucleic Acid (RNA) from these archived samples. They hypothesized that the microHomogenizerTM (mH), developed by Claremont Biosolutions whose associates collaborated on the article, would effectively liberate the trapped molecular information from these samples – something that is very difficult to do because they are preserved in a formalin-fixed paraffin-embedded (FFPE) cube. Kelber explained that the samples are readily available for research, but the material within them is usually compromised because of the way they are preserved. The FFPE samples used in this study were generated from human pancreatic tumors surgically implanted and grown in the pancreata of mice — a cancer research method known as orthotopic surgery and developed by article collaborator Dr. Robert Hoffman, a professor of surgery at the University of California, San Diego. The procedure takes place at AntiCancer, Inc. which was founded by Hoffman. Kelber’s team validated their breakthrough method by evaluating how different biomarker genes are expressed in cancer cells when they are grown in different environments. Hoffman explained that this study reaffirms his laboratory’s previous work demonstrating the importance studying human cancer cells in the orthotopic environment. Adamian explained the low survival rate for pancreatic cancer patients is due in part to the difficulty of identifying biomarkers to make early diagnoses. Hoover, who began working on developing these novel mH-based methods as an undergraduate at CSUN, said the new technique will pave the way for better genome and RNA sequencing of patient tissue — a potentially life-changing feat for pancreatic cancer research. Claremont BioSolutions’ President and co-founder Dr. Robert Doebler, said the tool’s success is something to be lauded.